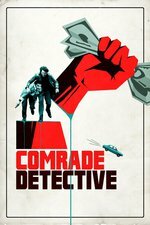 Comrade Detective purports to be a rediscovered buddy cop show from mid-eighties Romania, made as Eastern Bloc propaganda/entertainment. It isn't; it was filmed in Romania in the modern day, with Romanian actors, and then dubbed into English by actors like Channing Tatum, Joseph Gordon-Levitt, Nick Offerman, and occasionally guest stars like Debra Winger and Daniel Craig. In this episode: Baciu's family notices something unsettling; we hear Dragos's suspicions and learn something new about Stan; the American embassy is hospitable. Detectives Iosif Baciu and Gregor Anghel, framed for murder and smuggling, are on the run from their too-efficient colleagues, and seek Nikita's killer more urgently than ever, especially since he's captured Iosif's wife Sonya. They leave a trail of explosions and mayhem in their wake, with a pause at the US Embassy, where its guards' aggression hurts peaceful protesters. And Stan reveals his sympathy for an American real estate magnate who puts his name in big gold letters on the top of his buildings -- while killing Dragos, who's begun to suspect that something doesn't add up. I'll be interested to see what folks think of this. My wife is Romania and so we looked at this from a Romanian perspective. To us, the way they leaned on US cop show cliches (which I realize is part of the point) was distracting. The funniest parts were when they leaned in to the communist era with laugh-out-loud lines like, "There's no such thing as a crooked cop in Romania!" Obviously, we're coming at this from a very different place than people who don't know Romania. But for us, it would have been funnier if they'd used Romania as more than window dressing and a font for communism gags. This isn't to say we were tone deaf to the kind of parody they were going for, only that they may have wasted some comedic gold taking aim at easier cop show cliches. FWIW: fiercekitten posted full season discussion. I think an episode-by-episode discussion can exist beside a full season post.